Do you have a business idea and aspire to start your company and become your own boss? Then CEU iLab's Bootcamp, Global Entrepreneurship and Startup Camp is for YOU! The CEU iLab Bootcamp Global Entrepreneurship and Startup Camp will help you assess business opportunities and set up a robust business development process. You will have the opportunity to analyze real business cases, understand and evaluate business ideas, meet entrepreneurial teams, including guests and iLab startup teams, and discuss real-life business situations. In the CEU iLab Bootcamp, you will learn from discussions, situation games, case studies, team assignments, interview sessions as well as presentations. Successful graduates of the Global Entrepreneurship and Startup Camp will become CEU iLab alumni and will qualify to apply to CEU iLab incubation. Application is open until April 15. Early Bird fee applies for submissions before the end of March. The LLM Entrepreneurship and Innovation Clinic is a joint initiative of the Department of Legal Studies and the CEU InnovationsLab. It represents a unique opportunity for LLM students to gain practical, real-life experience on how to work with business people and how to become a real contributor to a business’s success. 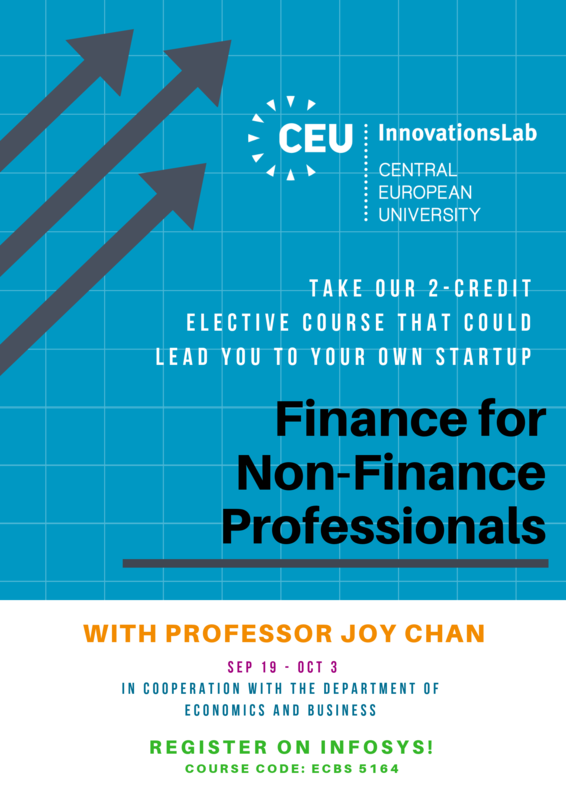 As one of the leading start-up incubators in the CEE, the CEU InnovationsLab assists CEU students and alumni in developing their innovative new business ideas with the ambition of making a global impact on society. At the Clinic, LLM students become legal advisors to the Lab’s new ventures, helping the teams to understand and overcome the legal problems they face in building and launching their start-ups. The course offers a blend of theories and practice. The first four sessions are devoted to the foundations of entrepreneurship and entrepreneurial finance, and to the development of soft skills such as interacting with and interviewing clients, translating business questions into legal problems, and structuring and drafting a legal memorandum. In the second part of the Clinic, groups made up of two students are paired with the Lab’s start-ups and meet with them under the supervision of experienced attorneys. Based on these meetings and their own legal research and analysis, each group then prepares a final memo that addresses their client’s legal issues and provides legal strategies that effectively contribute to their client’s success. During the final session of the course, teams present their experience and findings in front of their instructors and the entire IBL faculty. The course is designed to those students, who either have a business idea, or think, that during their carrier, they might start their own business. This course is highly interactive, and provides the students with the basic principles of entrepreneurial management. The key objective is, to equip the students with the essential knowledge, base considerations and experiences, which will help them to succeed in their business development efforts. The course, next to regular classroom presentations and discussions, includes situation games, case studies, team assignments, interview session and presentations. Essential element of this introductory course is to assess a business opportunity and a business development process. Meeting and interviewing iLab entrepreneurs and development teams, the students have an opportunity to analyze real business cases, understand and assess business ideas, entrepreneurial teams, and real life business situations. All registered students are offered with individual (group) consultation opportunity to discuss their individual business idea or current business development issues/problems. Individual consultation is available upon request.